When your organization prepares grant proposals, you likely include data and statistics about your services. One often-overlooked strategy to help prospective donors truly understand your work and find it imperative to make an investment is through including compelling stories along with your grant narrative. How well do you know your audience (aka potential donor)? What are their passions? Ask questions to find out what the donor’s passions are, and then your storytelling can bridge the gap between what the donor currently prioritizes and what you do. An effective story can create an emotional connection with the donor. Who is the main character of your story? For many organizations, the most common character will be someone or something your organization has helped, but a character could also be a staff member, donor, board member, volunteer, community advocates, or even a place. Describing a conflict gives your story drama and drives the emotional experience forward. In many compelling stories, the conflict arises when there are barriers faced by people when trying to reach positive outcomes on their own without your organization. Finally, the resolution to the story shows not just a happy ending to the story but a vision for the future where you can call your audience to action. 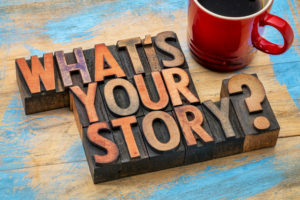 Storytelling is a powerful way to connect with potential donors on an emotional level so that they will respond to the needs of your organization and feel that they are making a difference. PGC can help your organization develop grant proposals that contain meaningful stories of your organization’s impact, which can help secure grant dollars to sustain your work. Call us today!